One island, seven destinations: Dinner in Italy then breakfast in Phuket? You bet. Seven hospitality villages at the Balesin Island Club offer amenities ranging from rooftop whirlpools in Mykonos Village to garden cabanas in Phuket Village. 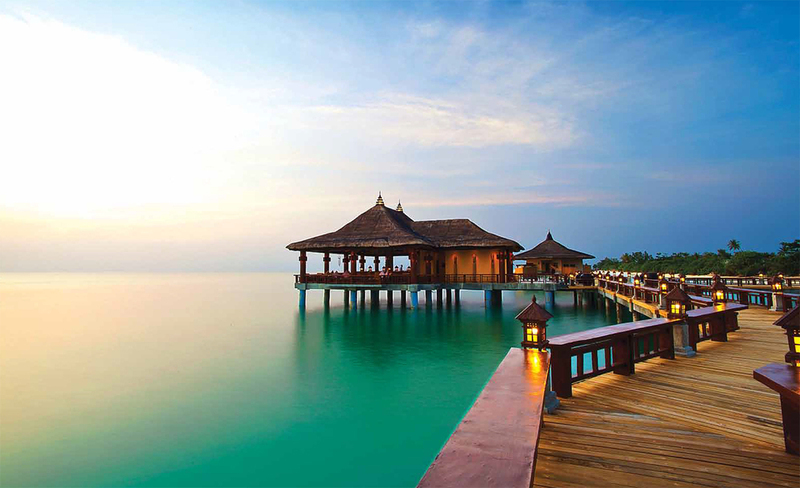 Here, stilt villas at the Bali village above the tranquil Lamon Bay (Photo by Matthew Acred). Fancy a private island shared with only a select few? Just a 25-minute plane ride from Manila takes you to the Balesin Island Club. Accessing this exclusive destination means you must either be a member or score an invite from one, but the perks are worth it. Aside from 7.3 kilometers of powdery, white-sand beaches, there are seven international beach destinations throughout the island. Think villas set amid the rice terraces of a Balinese village, sipping sangria at a Spanish-style café in Costa del Sol, or a speedboat ride to Balesin’s own French Riviera for crêpes. Balesin was originally owned by the Tordesillas family, who has been coming here since Edgardo “Ed” Tordesillas bought it in the 1960s. Back then, the runway was still a grassy airstrip and the accommodation comprised basic beach huts. 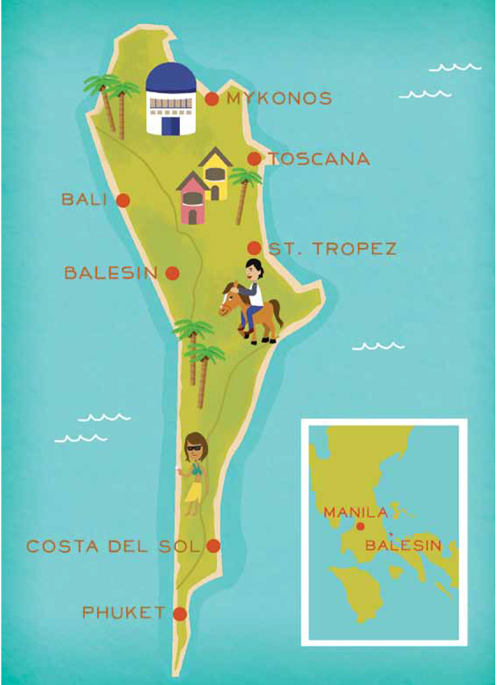 Ed dreamed of creating a high-end island retreat that works with Balesin’s natural resources. Years ago, he even planted mahogany trees to create wind barriers. These days, Ed’s son, Roque (who climbed the island’s banyan trees as a kid), returns with his own family, and after years as a rustic retreat, Balesin has gotten a first-class makeover. When Ed passed away a few years ago, the Tordesillas family sold Balesin to luxury property developer Alphaland, owned by Ed’s friend and fellow Balesin islander, Roberto “Bobby” Ongpin, who shared his vision for the island. Alphaland brought in Eco Plan of Florida, topnotch ecological designers, to balance luxury and sustainability. Now, Ed’s mahogany trees still stand majestically, and aside from a Club House (complete with four ocean-front swimming pools), there are seven hospitality villages with complete facilities, chic andintimate lounges and restaurants. The final three villages—St. 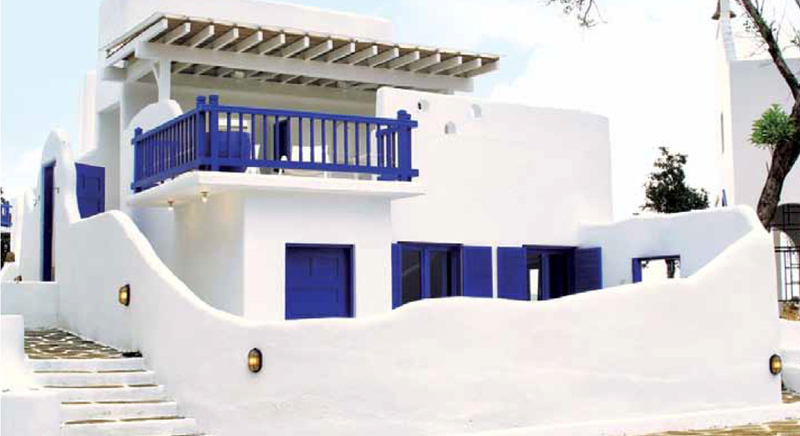 Tropez, Costa de Sol and Toscana—will be completed by the first quarter of 2013. Except for onsite eco-friendly transportation, cars aren’t allowed on the island, so explore by horseback, mountain bike, or even calesa—a small Spanish-style horse carriage. Electric golf carts zip down jungle paths that weave around trees rather than cutting through them. Here, design flows with nature. To preserve Balesin, only 50 out of 500 hectares will be developed while 80 percent of coral reefs and rainforests are protected. Organic gardens and aquaculture farms (which raise marine life such as lobsters, mussels and groupers) provide seasonal produce. Their son, 14-year-old Emilio, likes eating at the Club House restaurant. He’d be most excited to show his friends the equestrian and paintball centers. His eight-year-old sister Tessa enjoys the swimming pools at the Phuket Village where white-sand beaches stretch into a cerulean sea. Membership limits occupancy to maintain a balance between human development and nature, while guaranteeing a high standard of service and giving members a sense of belonging and home. It also gets you 14 complimentary nights a year. Interested? Log on to www.balesin.com. Reprinted with permission from Mabuhay Magazine, December 2012.